MOSCOW, Russia (CNN) -- Russian President Dmitry Medvedev on Tuesday signed a law extending the presidential term, the Kremlin said, in a move many observers believe is designed to bring former president Vladimir Putin back to the nation's top office. 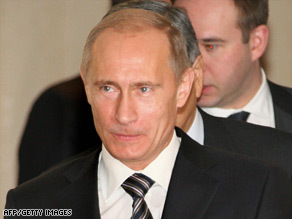 Some experts believe Prime Minister Vladimir Putin remains Russia's real leader. Medvedev, Putin's hand-picked successor, proposed the changes in November, starting with the next president. The new law extends the term of the president from four years to six. Medvedev also signed a law extending the term of members of the lower house of parliament, the Duma, from four years to five. Putin stepped down as president in May after two terms and is now prime minister. Earlier this month, Putin shrugged off the suggestion that Medvedev would step down to make way for his return when the law passes. "The next election is in 2012," he said December 4, according to the Interfax news agency. But his comments came after a three-hour televised question-and-answer session with the Russian public which reinforced some experts' view he remained the country's real leader. Putin has done call-in programs each year since 2001, but this was his first one as prime minister, rather than president. Putin remaining in the chair this year, rather than yielding it to Medvedev, showed he still runs Russia, said analyst Yevgeny Volk, the director of the Moscow office of the Heritage Foundation, a conservative U.S.-based think tank. Tuesday, Medvedev also signed a law giving the Duma more powers over the Russian government. The Duma may now consider annual performance reports issued by the government. CNN's Mike Sefanov contributed to this report.